Join us on a unique adventure out to the world's 3rd largest barrier reef system, the Florida Barrier Reef! Our Mini Sub tour allows you to experience a natural underwater eco system with minimal effort. Simply have a seat on an underwater scooter and navigate your way throughout parts of the reef system. 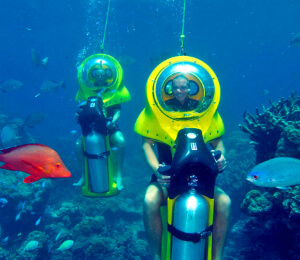 By design, you are able to breathe the steady flow of oxygen within the dome during your exploration beneath the sea, and there is no need to wear a snorkel or breathing apparatus. Powered by an efficient electric motor you will be propelled and can even steer the scooters as you find yourself mesmerized by the brilliantly colored coral formations that make homes to thousands of marine species. Commonly spotted along the barrier reef are Porkfish, Angelfish, Parrotfish, Triggerfish, Pufferfish, Gobies, Filefish, Grouper, Jewfish, Barracuda, Moray Eels, Green and Loggerhead Sea Turtles, and many more. Oh, and don't forget to bring an underwater camera with you and capture every up-close moment! Safety is of utmost importance to us, so we have a professional dive instructor on every trip to monitor the Mini Subs and ensure that everyone is moving along smoothly. All instructions will be provided on the boat ride out to the reefs. Also, we reserve the right to deny any that show signs of impairment at the time of boarding.